I believe this is a classic dilemma – if you love something enough, does it mean you want to eat it? Now I must confess that I am personally guilty of such behavior. In fact, when we went to the Monterey Aquarium and my five year old was happily petting a sea cucumber, I couldn’t help mentioning that sea cucumbers are delicious served with mushrooms. As much as I appreciate them, however, they pale in comparison to crab. The classic Cantonese way to cook crab with ginger and scallions is to deep fry the crabs in a scorching wok (preferably over a roaring gas inferno), then toss the glistening pieces in a ginger scallion sauce. But despite my love affair with pressure cookers, I’m secretly terrified of woks of boiling oil. So I’ve come up with a quick and easy way to steam-fry this dish. It’s not quite the same as the original, but it’s less frightening and won’t leave you and your kitchen covered with a thin, tenacious film of grease. Cleaned, freshly killed crabs. If you’ve never done this before, there are lots of good how-to videos on Youtube. Alternately, you can ask your fishmonger to kill and clean your crab for you. The body should be broken into 4 pieces, and the gills cleaned and removed. If you choose this route, make sure to rush your cleaned crab home on ice as soon as possible (raw crab spoils very quickly), then rinse all the pieces with cold water, drain and keep in the fridge until just before you cook. Buy the crab as close to cooking time as possible, certainly no further ahead than the morning of the day itself. 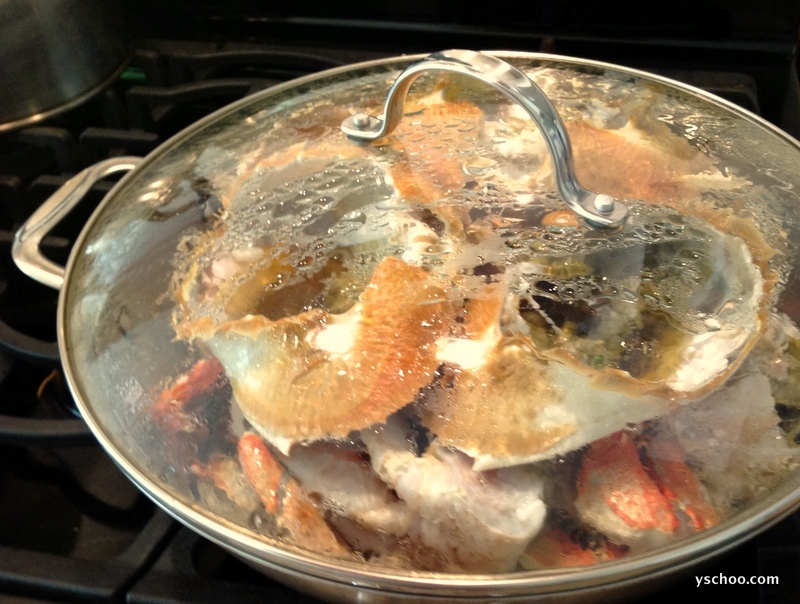 For this recipe, I used 3 Dungeness crabs (about 5 1/2 lbs total), but you can make it with just 1 large crab as well. Scallions/green onions – I used about 8 scallions, but if you only have 1 crab, you can get by with 2-3 stalks instead. Oil for stir-frying. Peanut works well, but I’ve also used olive oil and it’s been fine as you’re not going to have it over high heat for too long. Rice wine – I prefer to use Japanese sake (the drinking kind). Don’t buy the cheap Chinese “cooking wine” from the grocery store, which is heavily salted and tastes terrible. Just buy a bottle of sake, which you can either drink or keep for all your Asian recipes. Cut the scallions into 2-3 inch lengths, and peel and slice the ginger into fat toothpick-sized slivers. Put about 2 Tbsp oil in a large pan. You can use a wok if you have one, but I’ve found that a flat-bottomed chef’s pan does a great job over my comparatively staid gas stove. When the oil shimmers, add the scallions and ginger and stir fry until fragrant and slightly coloured (but not burned!). Add the crab body pieces and stir fry gently, turning them a couple of times in the ginger/scallions. Don’t do this too vigorously or the crab roe and all the other tasty stuff will fall off the pieces. Pour in a generous splash of sake, then arrange the crab shells on top, cupped upwards so that the juice will collect inside. Cover with a lid and finish steaming. Depending on how cold your crab is and how much you’ve loaded into your pan, this can take anywhere from 8-12 minutes. Check if you’re not sure. The crab shells should change colour, and the meat should be white and no longer translucent. If you’ve included the crab shells, the liquid inside the crab shells should just begin to gently bubble. Do not overcook! If you’re not certain, pull out pieces to test. Serve the crab with a generous handful of fresh cilantro and this dipping sauce below. I ran out of shallots, so this was made with garlic oil instead. Make a little shallot oil by slicing 1-2 large shallots thinly, then putting about a centimeter of vegetable oil in a small sauce pan. Heat the oil till it just shimmers, and add the sliced shallots. Remove from heat when the shallots begin to turn brown, but don’t wait too long as they will continue cooking even after you take the pot off the fire and will easily burn. This shallot oil is very handy to keep in the kitchen and can be used as a dressing for all sorts of things from boiled chicken to steamed eggs. If you don’t have any shallots handy, you can make garlic oil (which tastes similar) by mincing 2-3 large cloves of garlic and repeating the process above. 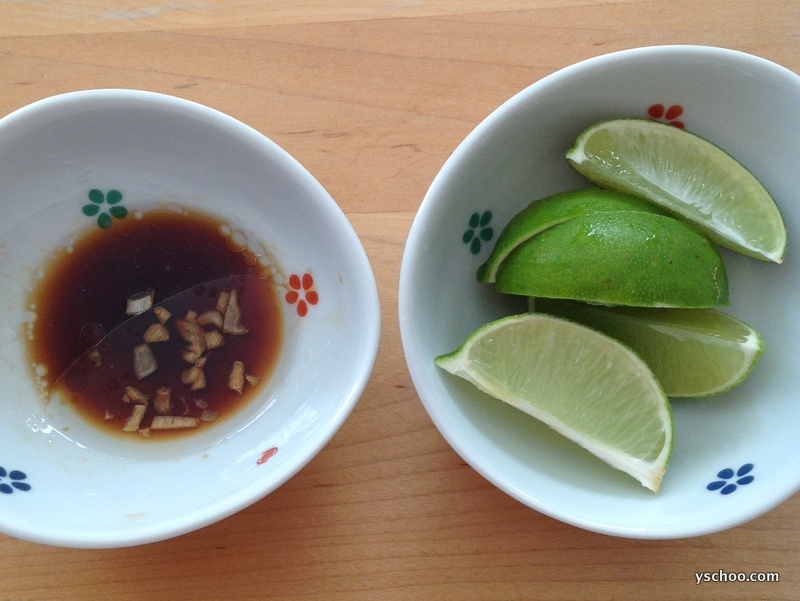 When it’s time to serve the crab, put a little soy sauce in small dishes and drizzle some shallot oil on top. Serve with a squeeze of lime or a dash of Sriracha hot sauce. Have you ever pointed out something tasty at an aquarium? I must say, Asian cooking does seafood the best! And if you can do it low fat, even better because of the scallions and ginger! Thanks for the recipe. yum! yum!! yum!!! I love the way Koreans gently cut the crab legs, gently turn it and pull it out with the flesh. Are you a korean?